Home » Blogs » Food and Health » Why you should stop drinking soda or coke? Pop, soda, coke, whatever you call it, the fact is well known that these are not good for your health. Anybody can rattle off at least 5 points on why you should stop drinking soda. If you don’t know the health hazards of drinking soda, let me explain a few. With only six ingredients in coke (carbonated water, high fructose corn syrup, caramel coloring, phosphoric acid, natural flavors and caffeine) at first glance it seems that, it’s not that bad for me. But let’s see more about these simple ingredients. High Fructose Corn Syrup (HFCS) : HFCS made from genetically modified corn contains about 20% glucose and 80% fructose, twice as much fructose as in table sugar. It is metabolized and stored in liver, as fat. This increased storage of fat in the liver can lead to increased incidence of non-alcoholic fatty liver disease. Studies also shown that long-term fructose consumption will accelerates aging. More than that, a number of studies has show that consumption of HFCS is will lead to weight gain, obesity, insulin resistance and type II diabetes. It will also cause hypertension, high cholesterol, kidney stone formation and gout. Caramel Flavoring : Are you aware of the fact that caramel used in sodas are not the same as what you might make in your kitchen? The caramels used in sodas are manmade chemicals. These caramels are prepared by reacting sugars with ammonia and sulfites under high temperature and pressures which results in the formation of 4-methylimidazole and 2-methylimidazole – found to be carcinogenic (Cancer causing) in the studies conducted by the NIEHS. Phosphoric Acid : It’s an acidifying agent used in soda. Consumption of phosphoric acid can lead to lower bone density. It’s because when your blood pH becomes acidic it is neutralized by pulling calcium from your bones. Natural Flavors : Don’t get confused by the word “Natural”. These are all artificial flavors. One among them is aspartame, is an artificial, non-saccharide sweetener used as a sugar substitute which breaks down into residual components, including aspartic acid, phenylalanine, methanol. This will further breakdown into products including formaldehyde and formic acid, accumulation of the latter being suspected as the major cause of injury in methanol poisoning. Caffeine : Like other stimulants, caffeine will release serotonin (“ the feel good hormone”). This initial release leads to an improved mood and feeling more alert. But soon there this is followed by a rapid fall in the serotonin levels which leads to crashing and feeling down. This depletion of serotonin will cause a cravings for caffeine and will finally cause addiction, you need more and more caffeine to keep getting the desired effect. Caffeine also has diuretic which will cause you to urinate more frequently. This will lead to dehydration. What happens in the body when you drink Coke or Pepsi? Still need more reasons for stop drinking soda? 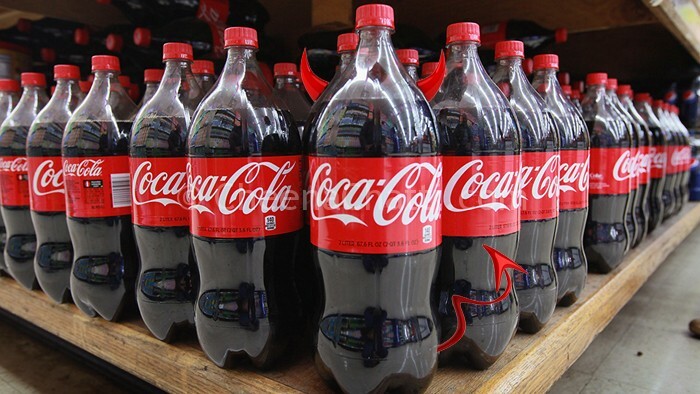 Financial burden : An average American drinks 216 litres of coke per year which costs around $600. High Calories with zero nutrition : The average can of soda contains at least 150–200 calories with zero nutrition. Health problems : It affects all body organs from head to foot. Soda can destroy your teeth (the phosphoric acid effect). It makes you obese / fat leading to insulin resistance and type 2 diabetes. It can cause 48% increased chance of heart disease – drinking just one coke a day is associated with 20 percent increase in risk of having a heart attack over a 22-year period. It can cause bone resorption / osteoporosis. Can cause liver problems – It can cause non alcoholic fatty liver disease. Can cause gastritis / heart burn. It can lead to depression and dementia. It can cause asthma – It is found that there is and increased risk of asthma and other breathing diseases in people drinking more than half a liter soda per day. Huge water consumption : As per what Coke says It needs 132 gallons of water to make a 2 liter bottle. Chances are there for the number can be even higher. Ground water depletion : Remember about the plachimada incident and ground water depletion in Kerala. Carcinogens expelled from the coke factories : The waste water expelled from coke factories after preparation contains many heavy metals like Mercury, Iridium etc which are carcinogenic and toxic to humans. They can pollute the ground water with in a large radius. Also studies have shown that it is not possible to remove the artificial sweeteners / agents from coke in a sewage treatment plant. Finally these will end up in drinking water again. Health hazard by the plastic bottles. Coke and Pepsi contains pesticides : Here is a direct quote from Center for Science and the Environment, India – “high levels of toxic pesticides and insecticides, high enough to cause cancer, damage to the nervous and reproductive systems, birth defects and severe disruption of the immune system” has detected in soda manufactured by Coke and Pepsi in India. See what Coke says about their product. If not for drinking, then what’s the use of Coke? To clean off your car battery, pour come Coke on it and it will clean it right up. A scientific volcano : Put a drop of Mentos inside a bottle of Coke and it will shoot out and explode. Clean Blackened Pots : Pour Coke over the entire blackened area, place over low heat for about an hour and the dreaded black film will be gone when you rinse. De-Rust : Soaking rusted items in Coke overnight and scrubbing the next day will get rid of rust easily. Remove blood stain : In many countries the highway patrol carries two coke in the trunk to remove blood stains from the highway after an accident. To clean a toilet: Pour a can of Coke into the toilet bowl and flush it after one hour. Research indicates that drinking 8-10 glasses of water per day could significantly ease back and joint pain for up to 80% of sufferers. Drinking 5 glasses of water daily decreases the risk of breast cancer by 79%, risk of colon cancer by 45% and a 50% low risk to develop bladder cancer. The high specific heat of water helps you to regulate your body temperature. Water is essential for our body cells. Water is essential for Metabolism, Brain and all human systems. I will be very happy if you remember these reasons for stop drinking soda and prefer to choose a bottle of water instead of soda, next time when you are thirsty. So what’s your choice? A bottle of Water or coke? – leave your comments below and if you find this post useful feel free to share this post with your friends. This entry was written on September 24th, 2013 by Renoos. Posted in Food and Health and was last revised on May 8th, 2014. The sad thing is that, all people are aware of these issues. But they have an attitude like I don’t care. I took my last zip of coke in 2003. This post will be a great inspiration for anyone who wishes to quit. Why we should stop drinking Coca Cola.